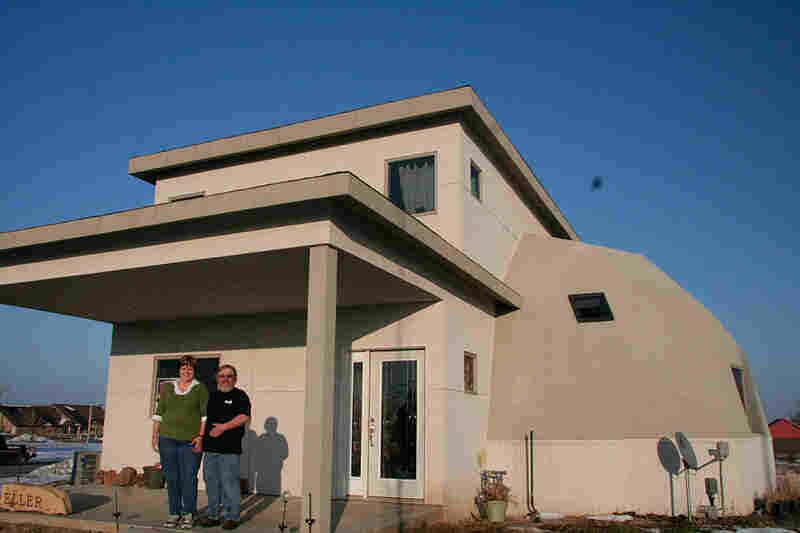 Town Rebuilds Green After Devastating Tornado Three years ago, a massive tornado ripped through the town of Greensburg, Kan., leaving ninety percent of the population homeless and 11 people dead. But there is new growth: a super-energy-efficient City Hall made from reclaimed brick and wood; an art center powered by the sun and wind; and a home modeled on a geodesic dome. And the rebuilding brought its 900 residents closer together. Jill and Scott Eller moved into their new home a year ago. Like many residents who live in Greensburg, Kan., they were uncomfortable with environmentalism — but they are glad about their decision to stay in town and go green. Three years ago, the town of Greensburg, Kan., was almost totally destroyed by a tremendous tornado. Ninety percent of the population became instantly homeless. Eleven people died. Near Main Street, there is still evidence of the devastation: Piles of brick and debris, flat empty lots filled with a dusting of snow and dirt, skeletons of trees that once made up the beautiful arbor that this town was known for. But there is also new growth: a super-energy-efficient City Hall made from reclaimed brick and wood; an art center powered by the sun and wind; and in the distance a home modeled on a geodesic dome. They're things you wouldn't expect to find in rural conservative Kansas. I could see that the truck was on him. But I couldn't move it. So then I just started screaming. My only thoughts from now on was for Harold, to get him out of there. ... It took 12 men to lift it off of him. He lived for 10 days. Every 48 hours they did surgery on him, trying to save him. The tornado of May 4, 2007, was immense -- more then a mile and a half in diameter. The entire town of Greensburg is only slightly wider, just 2 miles. The twister had a perfectly formed eye, with winds sustained well over 200 miles an hour. With a force of nature that strong, nothing is left standing. Sarah Schmidt and her husband, Harold, hid in the basement as the tornado raged overhead. It pulled off their roof and launched a truck inside their house. "The first thing I said was, 'Is this a truck in here?' " Sara Schmidt recalls. "And I didn't realize Harold had been picked up and carried across there. He answered and he said, 'I know, it's on me.' He said, 'Can you try to move it?' Well, I could see that the truck was on him. But I couldn't move it. So then I just started screaming. My only thoughts from now on was for Harold, to get him out of there. ... It took 12 men to lift it off of him. He lived for 10 days. Every 48 hours they did surgery on him, trying to save him." As Schmidt and the rest of Greensburg grieved their losses, the leadership of the town began to face some tough decisions. "You know the first reaction of some people was, 'Well, why are you gonna even bother to rebuild? You know. I guess my reaction was the opposite, 'Why not?' " says John Janssen, who was the City Council president when the tornado hit. It was his, and the relatively new town administrator Steve Hewitt's, task to guide Greensburg into the future. 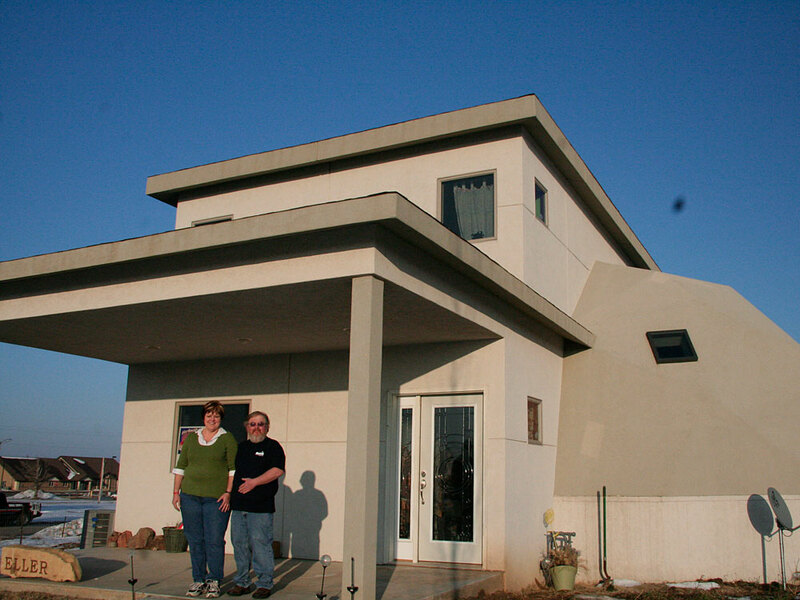 This silo-shape "green" house will be part of a chain of eco-homes built in Greensburg, Kan., after a tornado wiped out the town. "Well, the tornado destroying everything not only transformed the community physically, but mentally, it allowed people to say, 'OK, what were we like prior, you know, pre-storm. And if we were this declining, status quo community, what do we need to change to become this thriving new community?" Hewitt says. Just days after the tornado, Hewitt, Janssen and the mayor at the time, Lonnie McCollum, all of whom had lost their homes, met near the spot where town hall used to be. "I guess we were under the tent down by the courthouse probably, and we're sitting there going, 'You know, this is total devastation. We might as well do this right,' " Janssen says. "We hadn't thrown the word green out there, but we were immediately talking about better building, smarter building and smarter grid -- better infrastructure," Hewitt says. "And within about 12 hours, Lonnie stood in this national TV interview, and he says, 'And by the way, we're gonna rebuild green,' " says Janssen. Greensburg sits on a freight train line that cuts across the flat open prairie. Before the storm some 1,400 people lived there. Now there are just around 900. It was the kind of place where on summer evenings, people gathered at the local soda fountain where the guy behind the counter had your favorite drink order memorized. There's only one stoplight in the town, the politics are conservative, and there are more churches than bars. Its claim to fame? It was the home of the world's deepest hand-dug well. Back when the well was dug in the 1800s, it was a simpler time and most Kansans lived off the land; those low-impact methods of getting things done were commonplace then. Greensburg's founding mothers and fathers were the original environmentalists, conserving water, using wind power. But the thought of telling people to "go green" in red Kansas is something that doesn't seem possible. Green in that "save the planet" sense is thought of as a four-letter word here -- associated with liberal tie-dyed tree huggers. Slowly though, many of the residents came around to the idea. Jill and Scott Eller moved into their new home a year ago. 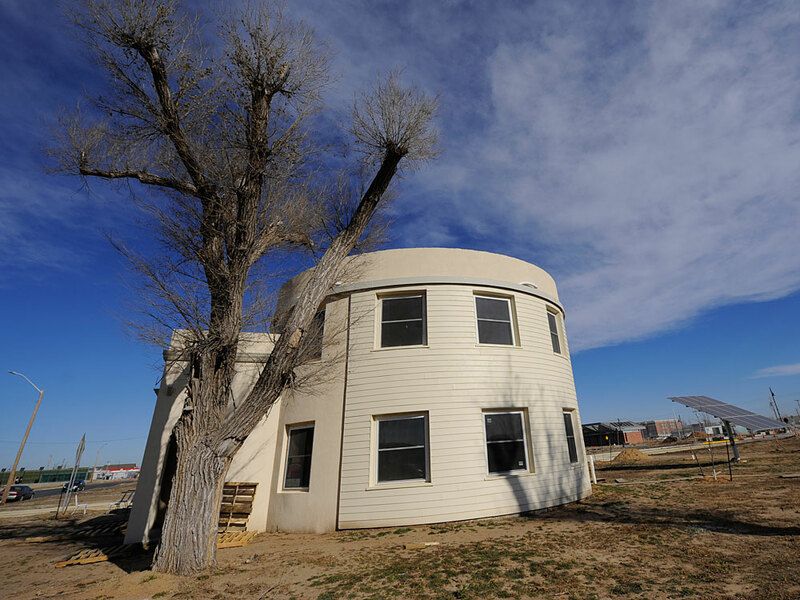 It's sort of a geodesic dome that has been split in half to bookend a modern two-story house. It's bright and wide with a kitchen that fits their needs. "I think we entertain more now than we ever did before," Jill says. Scott's family has been in the area for four generations. Jill moved to Greensburg 20 years ago. They both work in the oil field business. Like many residents who live here they were uncomfortable with environmentalism. Now the Ellers know the lingo: They can deliver a discourse on R-factors, SIPs (structural insulated panels), geothermal and LEED platinum certification. But it took a while. "You know when they came up with the green idea it didn't seem like a very big priority to us," Jill says. "We didn't know anything about it and we're from Kansas. We don't change our ways very often. And we lost friends in the tornado. I thought, you know they're talking about green, we had people that died here, you know?" Today, they are glad about their decision to stick around and go green. "People who've moved away, say, 'You know, I wished we'd thought about it a little more.' Because they sure miss being here, being part of this community," Scott says. "With the green initiative, it helped us to heal. It gave us something to look forward to," Jill says. Looking around the new Greensburg, you can see the change that's come, from the city hall built with recycled materials to a new downtown business center with the words "To the Stars through Difficulties" chiseled into its keystone. That phrase seems to fit Sara Schmidt perfectly. She thought hard about whether to rebuild or not, and discovered an answer growing in her yard. "I found this cox, [a] big coxcomb plant. I'd never seen a coxcomb plant so pretty," she says. The tornado destroyed Schmidt's house. It took her husband of 54 years. It forced a woman in her 80s to completely transform her life. And yet, unlike most of the other older residents of Greensburg who have fled permanently to neighboring towns and cities, she has chosen to remain with her town. "I looked at that and I said ... through all that's been, the machines that cleared off the cement, and how that little plant had survived. ... And so I told God, 'If this is what you want me to do, I'll do it.' And that's when I made my decision. If that plant could grow through that, in Greensburg, I could," she says. "Here I am." Al Letson is the host of State of the Re:Union, a new show in conjunction with Public Radio Exchange that searches to find out what unites people as well as pulls them apart.